REUTERS/Anders WiklundBritish Prime Minister David Cameron and German Chancellor Angela Merkel share a boat in Stockholm. Good morning! Here are 10 of the biggest stories you need to know before US markets open. 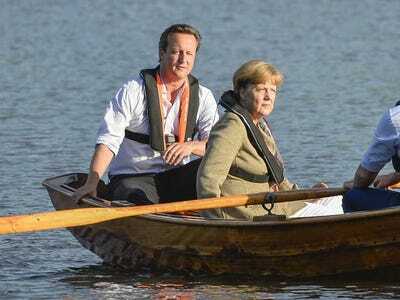 Angela Merkel Hit Out At David Cameron. The German chancellor has signaled to the British prime minister that renegotiation of the European Union’s freedom of movement is not on the table. The Eurozone’s Manufacturers Reported Weak Growth. The euro area’s four biggest economies had a PMI score of 50.6 for October, slightly higher than September’s figure but barely above the neutral 50 mark. HSBC Is Bracing For A Major Forex Fine. The bank is the third in the last week to report that it’s putting aside hundreds of millions for potential fines linked to an FX probe, following Barclays and RBS. Ryanair Isn’t Gloomy About Europe’s Grim Economy. After reporting a boost in profits, Ryanair CEO Michael O’Leary told analysts and reporters that a bleak picture for Europe could mean more demand for his budget airline. US PMI Data Is Coming. Markit’s October manufacturing PMI is out at 9:45 a.m. ET, followed by the ISM manufacturing PMI and September’s construction spending figures at 10 a.m. ET. Economists are expecting a 0.7% boost to builders. Growth In China’s Service Sector Dropped To A 9-Month Low. The official non-manufacturing Purchasing Managers’ Index (PMI) fell to 53.8 in October from September’s 54.0, which was the weakest reading since January, the National Bureau of Statistics said. Russia Is Doubling Down On Its Disastrous Ukraine Adventure. The Russian government has officially recognised elections in rebel-held Donetsk and Luhansk regions in eastern Ukraine despite UN warnings that they violate the peace agreement in the country. European Markets Opened Down. France’s CAC 40 is down 0.41%, Germany’s DAX is down 0.34% and the UK’s FTSE 100 is down 0.32%. The Nikkei was closed for a public holiday, and the Hang Seng closed down 0.34%. Toyota Is Beating China’s Slowing Economy. Toyota and its two Chinese joint ventures sold about 104,700 vehicles in China in October, up 27.1 per cent from a year earlier. After A Boost To The Country’s QE Program, One Japanese Minister Wants More Stimulus. Japanese Economy Minister Akira Amari said on Monday that the government should deploy fresh fiscal stimulus to prop up the economy if third-quarter gross domestic data turns out weak.